Torrential rain and overactive under-fives call for measures of Machiavellian brilliance. Brilliance which I, Auntie Kate, possess. When I walk away from my three working days the eyes of my colleagues follow me with envy. I’d like to be walking out just like you, they intimate hungrily. And that, my friends, is because they have never met four-year-old Big Al. You can imagine that the incessant spell of rainy days has presented some challenges. Not to sound like a 19th century matronly nanny, but small children need exercise, physical and intellectual. And by yesterday there was an agreeable but slightly unhinged look in the eyes of my small nephew. I had been giving this matter some consideration, and came to the conclusion that the only thing for it was a train ride. Train rides provide a modicum of air, albeit diesel-laden. They provide long walks down endless covered platforms and a different stimulus every millisecond. One gets the exhilaration of crowds and the sustenance of a bun shop. So I met Al from playgroup and we cheated: we went out for lunch and then drove with great ceremony to park in the station car park. My plan was to take any train, anywhere, the first one that came and promised to be back in time for school collection time. My car is an ancient seven seater Mercedes with a rear-facing chamber at the back. This is Al’s office. He uses it to conduct his many operations with the voice of a bellowing balrog. I left him sitting in his office and stepped three cars away to the ticket machine. One cannot tell an automated lady to hold. I bellowed back: “Al, I’m just talking to a lady to get a car ticket….” but I had lost her. She said “goodbye”with infuriating finality and hung up. No time to rant. I scrabbled for change and found just enough, unstrapped the bellowing town crier and put him in the position which has dangerous levels of potential energy: on his two feet. We talked about electricity, and why the fence was there and why the yellow line which runs along the platform as a safety guide. I don’t necessarily think Al was receiving: the sights and sounds were becoming intoxicating. We pottered past the bicycle bank and into the ticket office where Al introduced us to the man behind the counter. He brandished Felix’s toy train, a long black number, and before I could say “A return to Reading, please,” he had interrogated the gentleman as to whether the train we were about to get on was bigger than Al’s handheld. Al enchants people. The iron visage of the ticket officer softened, and he said, yes, the trains here were quite big actually. We got our ticket and climbed the stairs to the platform on the other side. We hadn’t long to wait. The coming of a train slowly along the track into a platform is an exercise in building suspense that Hitchcock would appreciate. Al’s eyes grew bigger and he waved energetically to the train driver. Who, because Al is Al, waved back. We sat down next to a window. I had thought his attention might wander during the 25 minute journey to a major station: but no; every inch of the way he was glued to the view. Firing questions possible and impossible, we sped through the countryside of Berkshire, noting car parks and fields and level crossings and signs. Al fell in love with the graffiti scratched into the glass of his window by some young citizen. It think that was his favourite. When we reached the big station we clocked high-speed trains and guards and whistles and the big bridge that runs over the busy track. We visited the bun shop to buy a bun to munch in the carriage on the way home. “Look at my train! : Al shouted joyfully at the cashier, who smiled indulgently. We got on the train, and munched happily, all the way home, tired but happy. And I am informed Al slept inordinately well last night. Posted in Big Al, UncategorizedTagged family, toddlers, train spotting, trainsBookmark the permalink. First Great Western. A fine introduction to train travel, although the toy train is probably more reliable and comfortable. It is. Maybe I could use it to cut down on my transport bills a little. I could just cuddle him! He is very cuddlable, Tandy. Still in Scotland? There are posters at each station with a number you call, Tom. Then you give them the details of the car and your credit card and they should do the rest. It sounds simple, but it SO isn’t. Have you ventured to Didcot yet? No. Good idea – they do Thomas days there, don’t they? There is nothing like public transport to enchant small boys, is there, Elspeth? This is fantastic! First of all, I love Al’s train. Second, when I come to London next you get to plan my itinerary. All by train. 😉 What a great idea for a day’s activity. I wish the same type of thing were available here. Reminds me of when I was a kid and get bored – my mother would take me to the airport just to watch the trains land and take-off. It is only now that I realize that she was probably watching those planes with a bit of wistfulness herself – dreaming of taking off to faraway lands. Or at least lands where children weren’t bored and incessantly questioning. What a fun time it must be to spend time with Big Al, and what a great Auntie Kate you are to do these adventures with the young master. As I mentioned yesterday, the Lovely Miss TK and I did the trains every day for 12 days when we were in Birmingham for the Rotary International Convention three years ago. A train from downtown in the morning out to the Convention Center at the airport and trains all over the countryside 7 of the days we were there. It is such a fun and entertaining way to travel and never boring, whether you’re people watching or just checking out the scenery whizzing by. Big Al is one lucky boy. He really enjoyed his introduction, Lou! But it’s only the beginning, you know…lovely to hear you got the most out of the train system here. 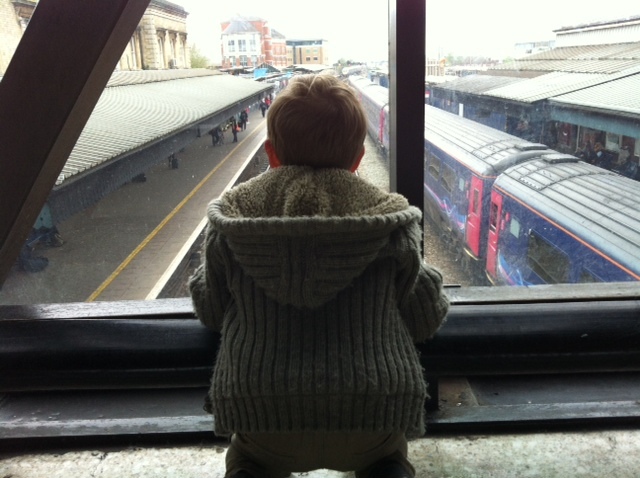 Nothing little boys like better than trains – what a clever Aunt Kate you are. Warm and cosy in the train whilst Al was fully occupied. You are a genius! Small boy busy happy and at the end tired. 😀 The tired bit was the best of all, Sidey! First-time visitor via Debra at Breathelighter … and the pic of your son staring at the trains from above has much to say. Hi! Thanks so much for coming to read 🙂 Fortunately this is my nephew – I get to give him back at the end of the day – so we have auntie-style treats every Thursday and Friday. High jinks! I understand Sir Francis Drake’s mother took him on train rides all the time when he was 4 too. Career training or at least wetting the appetite. Will you be introducing him to cartography soon ? Felix is a born map maker, Carl, Al: not so much. But then he is only four. Who can tell what the future will bring? Trains are brilliant entertainment for people of any age. Big Al is lucky his Auntie Kate likes to ride them, too. He won’t soon forget this day. Off topic, but I thought of you today. Don’t laugh, but we were touring a house museum here, and the owner kept a mouse house in his bedroom, a Victorian device that allowed mice to be dropped in one hole and race through the labyrinth inside to find the out hole. It was something I thought Felix and Al would both find fascinating. Them and me both, Andra! Thank you, you are right: that would appeal to all of us here. Must go googling! Enjoy the rest of your stay….was MOST impressed by the President Andra picture on Lou’s FB! There is that saying, ‘to get your groove on’, but I think I would rather get a little bit of my ‘Big Al-ish-ness’ back. Often forgotten are the best parts of being young -eyes wide open and full of astonishment. A train ride perhaps? Sounds perfect, I have to remember this cure for when the rainy days a cometh and they always do from time to time..
Good to hear from you, Hudson! Hope all goes well with that raven enchantress of yours., the one with the huge entrancing eyes and long floppy ears. I agree: a train ride can really heal many ills. I remember a few which have got me out of quite a trough. Elvira is doing fine, thank you, definitely the most level headed of the two of us. She has been in a happy place since she found out she will have her own page when the new blog gets running -Elvira ‘Zen master of Beyond Plum Creek’. Between you and me, I think she has her sights on fixing the world once she has fixed me. Who knows, she has some pretty powerful shtufffs within her. Look at you, Auntie Kate, with all your creativity. What an imaginative way to spend some pent up four year old energy. In fact, I’m thinking that would be a wonderful way to spend some of my own water-logged malaise. Love the first photo with the engines – and, of course, the ever favorite Big Al. Brilliant day out, Kate, and tks for the pics yesterday. Mum was tired after today’s visitors, but will rest tomorrow. She has one of the less glamorous hospital conditions, but they are feeding her Semtex soup for it. Lovely day out, but I know how labour intensive it must have been, love. What a wonderful Aunty you are – I wish I could have come along for the ride! ‘Torrential rain and overactive under-fives call for measures of Machiavellian brilliance. What a wonderful Auntie Kate you are! Al will never forget this day! What a lucky boy. Felix loves the train, and taking him for trips via rail is one of my favorites, I imagine he and Big Al would get along famously in a rail yard.